South Webster’s Ellie Jo Johnson drives the lane on Northwest’s Abby Baer. Northwest’s Haidyn Wamsley brings the ball up the floor. South Webster says a team prayer following its game with Northwest. Basketball is one of the most physical sports that exist. 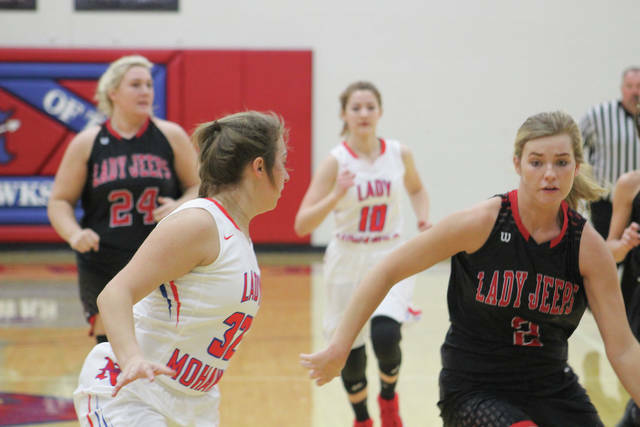 If you don’t believe that, you definitely weren’t in attendance at Northwest on Saturday afternoon when the Lady Mohawks fell to South Webster, 49-40. As the girls basketball tournament nears, the physical element of the game increases. Such was the case in this contest, as two scrappy groups collided on the court throughout the afternoon. That physicality can be expected around this time of year, after all. 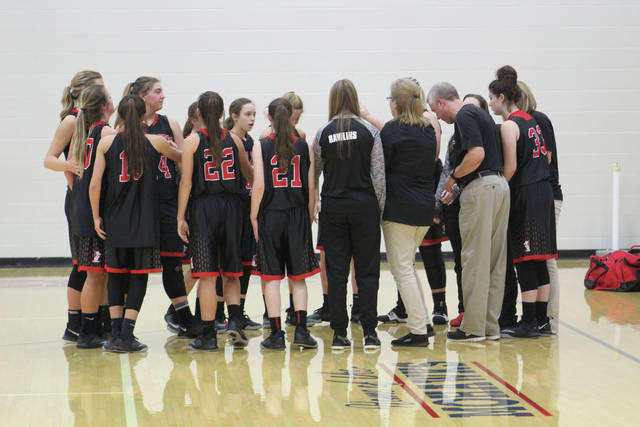 Although Northwest would come up short in the game, the drastic improvement the Lady Mohawks have made as the season has progressed is evident. 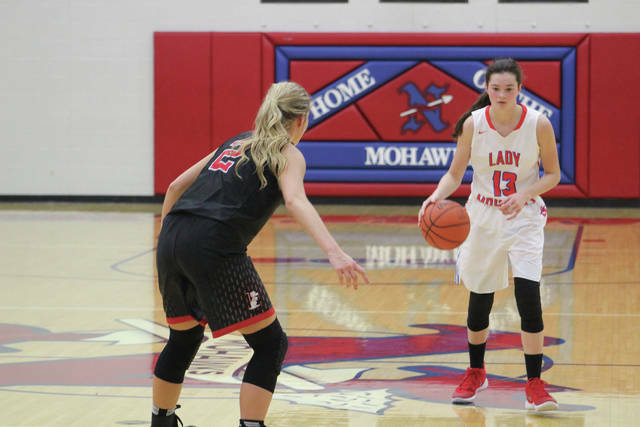 Sustaining the ball on offense played a big part in the rematch for the Mohawks, as they were able to maintain possession and run more half court sets by cutting down on turnovers. To start the game, both sides searched for an offensive player to lean on. Early for the Mohawks, it was Valerie Eury who scored four in the opening frame. Eury did a good job of attacking her defender and getting to the foul line, and would finish the night with a team-high 13 points. Eury has been vital to her team’s scoring success this season, but most importantly her unselfishness has been a huge boost. The aforementioned Wamsley posted nine points herself on the game. After the first, Northwest was up 10-7. Out of the gates in the second quarter, Avery Zempter knotted the score at 10 with a three-pointer. Zempter had nine in the game, hitting a three in the first three quarters. Her performance was all a part of Johnson trying to build her confidence as a scorer. In a quarter with six lead changes, South Webster got one more score than the Lady Mohawks to take a 22-20 halftime lead. The third quarter saw the Jeeps jump out to a 14-5 overall edge to take a 36-25 lead after three quarters of play. After a pair of Eury free throws tied the game at 24 with 6:28 left in the third, South Webster went on a 12-0 advantage. Experimenting with different lineups, the Jeeps were able to take advantage of the size discrepancies on the floor and worked their way down low for some easy scores. As a result, senior Ellie Jo Johnson had a game-high 14 points, and junior Madison Cook added 13. The majority of their scoring came from inside the paint. That big third quarter propelled South Webster ahead by just enough, as they kept their lead out of reach during the fourth. The Jeeps continued to strike from inside, scoring almost at will down low. In the second half, Frantz saw an area of growth for his team to pursue moving forward. An Abby Baer score off a rebound with 1:05 remaining cut the South Webster lead to single digits again, but the Jeeps closed it out down the stretch to win 49-40. Northwest put forth a good battle, even getting quality minutes from bench players like Skyler LeBrun, Sylar Patty, and Terah Webb. Frantz was impressed with the play of LeBrun and Webb. Webb would hit a three in the closing seconds of the game, and both gave the Mohawks some flexibility off the bench. With the game in the books, it’s now tournament time for both schools. Northwest will take on Huntington Ross in a game they anticipate will be tightly contested. It’s the most wonderful time of the year for Johnson, who says she and South Webster love the tournament. It won’t be easy for the Jeeps in their first round game, either.